Matthew James Didier lives in west end of Toronto, but his readers would never know it. He seldom writes about the city. When he pens his blog, Didier escapes the GTA and hops around Canada (and back in time) profiling Canadian authors and showcasing vintage film clips he finds on YouTube. He writes about old and new science fiction classics; specifically the TV program Dr Who. Last month Matt dredged up some classic CBC radio interviews with Peter Gzowski (much to my delight). Yes, Matthew Didier is a proud Canadian, but to my ear his blog has the same kind of thick British accent you might have once heard on a Routemaster double decker bus. Old Green Bus started in April 2006 when Matt and his family were going through hard times. Like so many other creative souls he went online to license his imagination and explore the possibility of infecting others with a unique vision. And his idea? He had a rather strange idea actually. 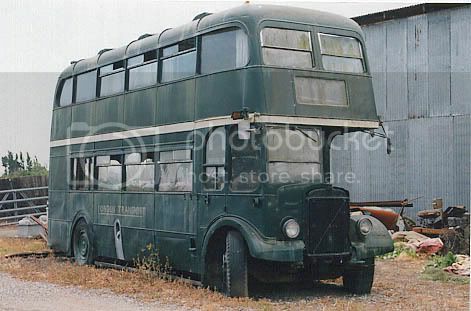 Here it is, a 1950 AEC Regent III double-decker bus in a 1999 photograph. Complete with London Transport fleet names and lots of other cool authenticities, the vehicle looks to be in reasonable condition – only the radiator and most of the engine cooling system is missing. The story goes that this vehicle was imported into the United States from England and came to be owned by two women from Oregon. It was sold in Santa Rosa California when it broke down on the highway and was deemed too expensive to repair. Now if it could be properly fixed and completely refurbished, it would certainly be a novelty on the streets of Toronto. Mathew was consumed checking vehicle insurance quotes in Canada so I’m sure that’s just what he was thinking. In keeping with the same spiritual idea of raising the dead, this blogger is also active in the Toronto Ghosts and Hauntings Research Society website where he continues to serve Canadians by conducting paranormal investigations in historic Toronto properties. Anyone can find Matthew Didier on the PSICAN Message Board, a science fiction discussion forum he operates under the moniker “Inconvenient Facts”, and this according to Matt is not a play on anything to do with former Vice President Al Gore’s efforts, but from a book entitled Roswell : inconvenient facts and the will to believe. Suffice to say, One Old Green Bus is more than a Dr Who fan blog. I remember watching the first Dr Who series on BBC TV in England in the 1950’s in black and white. The special effects were pretty ghastly in those days. I still like science fiction. I have ridden many a bus like the old green bus but mostly the red ones in London.